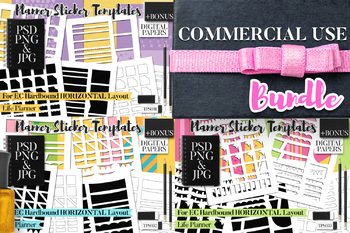 Commercial use planner stickers templates bundle. 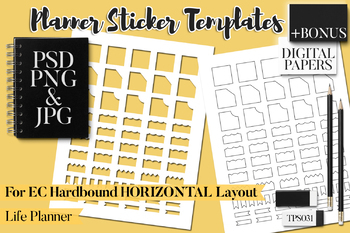 Making planner sticker will be much fun and easier with these templates! Fun DIY kit with a bonus of digital papers. Have fun creating your stickers, and earn cash too! Great templates for planner addict! 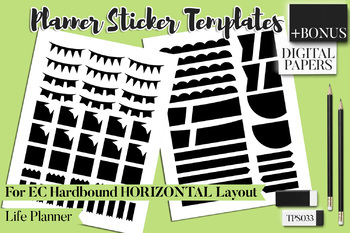 These templates are specially made to fit Erin Condren Life Planner HARDBOUND HORIZONTAL LAYOUT. Full box size (on monthly calendar page) is 28mm x 28mm (or approx. 1 1/8 x 1 1/8 inch). DIY Erin Condren Life Planner stickers in easy way! 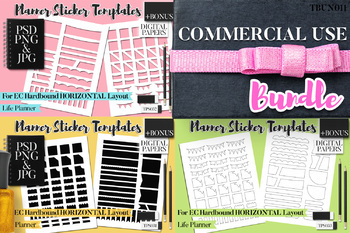 Blank templates for planning stickers! A fun kit bundle. Commercial use. Great for making printable and printed stickers for sell! Sheet size: US Letter size. For both personal use and commercial use. You can use these templates to create and make stickers for sell, printed and in digital printable format (small business only). Super fun kit for planner stickers addict, shop owners and sticker sellers! - Just add your own designs and elements below the transparent template (when using the photoshop PSD file or the PNG transparent file). - The JPG files come with black outlines. You can resize your design elements to fit each black line box. - To open the photoshop PSD files, you will need to have graphic programs such as photoshop, photoshop elements, and gimp. This pack also includes PNG file of black silhouette. You can open this file in silhouette studio. And from there, you can make cut lines. Each template is in photoshop PSD (with layers), transparent PNG, JPG (with black outlines for guidance), and black silhouette PNG format. Commercial use license. Small business only, up to 1000 copies/ 1000 downloads. If you’re going to produce and sell more than that, you can purchase mass production license. Cannot be resold “as is”. You must create something new out of this template and paper collection (such as printed stickers or downloadable/ printable stickers). Cannot be used to make another templates/ DIY kits for resell. To get actual size stickers that will fit to your planner (EC Hardbound Life Planner Vertical Layout), please make sure to change your printer setting to be 100% (actual size) and not "scale to fit".